Dan Defeats the Dragon. Again. worldwary on Who is the World’s Best Rugby Team in 2008? easlen on Dan Carter’s Super Rugby Record: 1,022 Points! bebo on Who is the World’s Best Rugby Team in 2008? The first game of Super Rugby played in the northern hemisphere was a doozie! A few hours ago the Crusaders beat the Sharks 44 to 28 in a fierce contest marked by scything runs and ferocious clear-outs. The Saders put up 4 tries in the first 30 minutes and looked to have the match in hand. But the Sharks stuck with their game plan of dominating rucks and quick recycling and clawed their way back into contention. It was talent versus character, brains versus heart, and with 15 minutes to go, it was anyone’s game. The end of the game probably came as a disappointment to fans of both sides. With 9 tries scored (5 to the Saders, 4 to the Sharks), no one wanted it to end. If there was any pressure on the players to put on a good show for the northern hemisphere audience, they didn’t show it. There may be a few who complain about the high score, saying real rugby ought to be a grinding, slow-moving affair. But I suspect there will be more who will be won over by the dizzying pace and rapid ball movement. This was helped, in part, by referee Steve Walsh who evidently left his whistle at home and let most infringements go. The game was very much a clash of styles. The Saders with their monster backs ran like they were in a Sevens tournament. The Sharks with their monster forwards totally owned the rucks. Standout players for the Crusaders included the hard-running Sonny Bill Williams, the energetic Keiran Read, and Zac Guildford, who slotted back into the starting XV like he hadn’t been away. Standout players for the Sharks included the enterprising Ryan Kankowski, Jacques-Louis Potgieter who scored in a brilliant individual try running 50m through traffic, and the hard-to-put-down Tendai Mtawarira. Why the Beast isn’t in the starting XV is a mystery to me. My MVP was Dan Carter. Once again he was the maestro leading the orchestra and his flawless kicking (7 from 7) meant the Saders weren’t under quite so much pressure when the Sharks came storming back in the second half. Kudos to the BSkyB commentators who were operating well out of their comfort zone. For a while there it seemed that they knew the names of only two players – Sonny Bill Williams and Dan Carter – but they otherwise called the game well. And those super slow-mo replays that are a regular feature of Six Nations rugby were brilliant. Dear Mr Murdoch, can we have those down south too? The Sharks players went straight from Twickenham to the airport, heading home to prepare for their next match against the table-topping Stormers. The Crusaders have a week off to lick their wounds (injuries to Carter, Read and Sam Whitelock could be costly) before preparing to face the reigning champs, the Bulls, in Timaru. This weekend history will be made at Twickenham. The Sharks will enter the history books as the first Super Rugby team to get spanked in the northern hemisphere while the Crusaders will become the first southern hemisphere team to enjoy victory baths in the English changing rooms. Speaking of the Saders, a South African friend recently suggested to me that the red and blacks are currently better than the All Blacks. Well there’s probably a fair amount of overlap between those two teams, but after a second’s thought I had to agree with him. With two exceptions, I would take every one of the starting Crusaders over any other All Black in the same position. Who are the two exceptions? 2. I’d also take Hosea Gear over the rookie Adam Whitelock on the left wing. 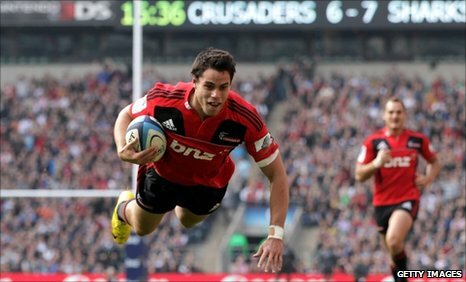 I can’t believe I’m saying this, but I would seriously consider giving Sean Maitland a run at 14. I’ve been no fan of his over the past four years, but he’s having a brilliant start to the 2011 season. So maybe he’s washed off all that butter that used to be on his fingers. It grieves me to say it, but have some reservations about the ABs winning this year’s RWC. I can sum those reservations up in two words: Peter Grant. Cup finals are not decided by tries but kicks. Whoever is kicking better on the day will win. Period. Right now the Stormers No.10 is probably the best kicker in the tournament. I know it’s early days, but I reckon the way things are shaping up, it’ll be Grant and not Steyn who runs out for the Boks in June. Having a reliable kicker is supremely important in World Cup final. Remember how good Elton Flatley was when Australia lost to England? Flatley was outstanding but it was Jonny Wilkinson who got the last kick in. That’s it. Four years of preparation comes down to kicking on the day. I predict the All Blacks will blow every team out of the water with their superior try-scoring offense. But come the semis and the final and everything will change. The games will be super tight defensively and if Carter kicks well NZ will win and if it’s close then Grant (or Wilko!) will knock over a DG. This will be followed by four more years of wondering what went wrong. The new Super Rugby season is about to kick off with a new team and a new format. I think the new arrangement has a number of positive features. For instance, I like the idea of the Crusaders getting to beat the Canes twice in a single season. More local derbies is a big plus. But there are two things I don’t like about the new format. 1. Not every team gets to play every other team. This year the Saders won’t get to play the Stormers unless both teams meet in the finals. That’s a pity. 2. It means the Grand Final will be in Brisbane. Why do I say that? Because the top two teams in each nation are guaranteed an appeance in the finals with home court advantage going to the team with the most competition points. So while the South African and Kiwi teams will be beating themselves silly, the Queensland Reds will be quietly riding the wave of mediocrity that is Australian rugby to the top of the table. The Reds will have no problem beating the Rebels, the Force and the crumbling Brumbies. Sure, they’ll lose to the Tahs in Sydney but then beat them in Brizzy. Boosting their chances further is a sweet fixtures list that means they will play a number of tough games at home, including the Bulls and Saders. Last year the Reds beat both of those teams at home and this year, for some inexplicable reason, they get the chance to do it again. So put your money on it – the Reds will be in the Final simply because the new format favors them more than any other team. And the Crusaders will smash them. What a match! What an ending! The 2010 Tri-Nations is over with two tests remaining. 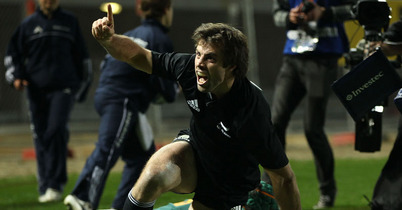 With four victories in four tests, New Zealand won the cup that they lost to South Africa last year. They did it in emphatic fashion with a last gasp 29-22 point win over the Boks in Soweto. Springbok fans will be heartbroken, and none more so than captain John Smit, losing in his 100th test match. An official record 94,700 fans came out to support their team who were so far win-less in this year’s 3N series. And what a difference three weeks make. For most of this match the Springboks were playing with their old verve, smashing into tackles and driving runners back. What particularly struck me was that they were smiling. Right from the haka to the 77th minute, the Boks looked happy to be playing rugby. What a change from a month ago. Two Boks who really stood out were Juan Smith and Francois Hougaard. The whole back row looked good for South Africa, but Juan Smith tackled everything, even the referee. (And boy was he apologetic about that!) Hougaard was the best of the four scrumhalfs who played by a long stretch. The All Blacks played well below their normal standard, and that mostly reflected the intensity of the Boks’ defense. When they did break the advantage line they often ran unsupported. Both Dan Carter and Cory Jane found themselves inches from the try-line with the ball in hand but no support. The Boks had the advantage in the scrums and under the high ball. Morne Steyn kicked a perfect 6 from 6. (Carter kicked 5 from 8.) But on defense, the ABs were at least their equal. What decided this evenly balanced game? In two words, Richie McCaw. If there was ever a captain that just refused to let his team lose, it was Richie in this match. He was involved in everything. He broke tackles, stole the ball, and scored the levelling try under huge pressure when there was just three minutes on the clock. Carter missed the conversion giving Boks another chance to win. At that point you would’ve put good money on Morne Steyne slotting a drop goal. But the ball was lost and the next moment Nonu was busting through a missed tackle from John Smit then making a sublime pass to send super-sub Israel Dagg across the line. Game, set and series New Zealand! Four tries to zero. Tonight at Eden Park the Springbok myth ran into hard All Black reality. For the past 12 months there has been a sense that the second best team in the world was really the top side. But tonight the pretenders were completely outplayed by the number one-ranked side with the ABs winning 32 to 12. It was a night of surprises: The great Pierre Spies was totally outclassed by his opposite, and occasionally pant-less Keiran Read. The journeyman Tom Donelly outplayed the legendary Victor Matfield. The NZ front row put the South Africans on the back foot all night long. Who played well for the Boks? Zane Kirchner was always at the right place at the right time. Morne Steyn kept his side in the contest with four penalties, but it wasn’t enough. Habana put endless pressure on the NZ back three. Even Rickie Janurie put in a good effort in the first half. And the rest? Well Bakkies was Bakkies and Butch was Butch. Both of them were oafish and unprofessional. Bakkies managed to play all of 12 minutes before being sin-binned and will probably receive a suspension for head-butting Jimmy Cowan from behind. John de Villiers should’ve stayed in Europe. During the post-match interview John Smit gave that smile we’ve seen many times before that seems to say, “just wait until next time.” It’s always next time. Who played well for the ABs? Tom Donelly, Keven Mealamu, Mils Muliaina and Richie McCaw were outstanding, but my MVP was Kieran Read. His goofy smile belies a truly world-class competitor. All week I had been saying to anyone who listened that the All Blacks were going to win this one easily. Local Aucklanders, long used to disappointment in their rugby, shook their heads with sad pessimism. “Oh no,” they said, “the SAFFAs are too strong.” They will now probably say a stung Springbok side will come out firing next week in Wellington. No doubt they will, but it won’t change a thing. The All Blacks remain the number one side in world rugby by a margin equivalent to four unanswered tries. In these seven matches Wales has scored, on average, 10 points to Carter’s 19. The All Blacks altogether have averaged 36 points per test, but there’s no story there. Carter has consistently scored nearly double the Welsh opposition over a period of 8 years. Last Saturday night in Dunedin he scored three points for every point they put on the board. (That’s two tries, four conversions, and three penalties.) And he only played 30 minutes of good rugby! Has there ever been a better example of one player consistently outscoring an entire team in test rugby?